Do they mean that the Jockeys lose that weight? Or the horses? Because I think the only way a jockey is going to loose five pounds in an hour is if you cut their leg off. 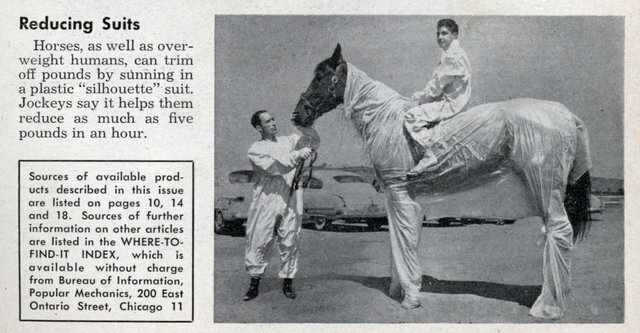 Horses, as well as overweight humans, can trim off pounds by sunning in a plastic “silhouette” suit. Jockeys say it helps them reduce as much as five pounds in an hour. It means that the horse will be as dehydrated as the jockey, which I’m guessing is a very bad thing for an athlete. Jockeys and wrestlers still do some crazy things to lose pounds to make sure that they fit into their handicap or weight category. Yikes.